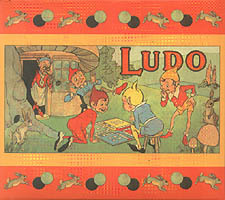 Ludo is based on an ancient Indian game (Pachisi) that was adapted by the British and imported back to Britain.The first real reference to 'Ludo' appears in about 1896. This version is based on a game from the 1920s. Ludo is simple to play and provides much fun for young children and at the same time helps them learn to count. Contains a 9 puzzle piece board, wooden counters, wooden die, rules.